Anything that had an appearance by the world’s most incompetent hunter. But don’t tell him I said that. Keep it vewy, vewy, quiet. Directed by Friz Freleng; Story by Warren Foster; Animation by Gerry Chiniquy, Virgil Ross, and Art Davis; Layouts by Hawley Pratt; Backgrounds by Irv Wyner; Film Editor: Treg Brown; Musical Direction by Milt Franklyn. A Merrie Melody released on October 13, 1956. We begin in Smurf Village. Or I guess right next door, as we look in a hollow tree that is close to the mushroom houses. Inside, we see elves. (Actually, it’d make sense that they would live in trees. It’s where they make their cookies) The leader looks an awful lot like Elmer, so let’s just call him what we all thought of: Elver. Clever, but not what I meant. He’s just got done reading the roll call. Despite making it past the Z’s he decides now is the time to question where all the missing W’s are. (I think that’s what he’s looking for. He says it as “wouble u’s”) One little elf, (who we will call Joey. Joey the elf) knows where they went: to help the shoemaker. (Either that or Santa mistook them for his. Just naming all the jobs elves do, today) Elver is upset. That was over one hundred years ago. (No, they never explain how the shoemaker is still alive. It’s one of three options: 1. The shoemaker takes really good care of himself, and has surpassed the average human life expectancy. 2. Eating an elf every year makes you immortal. 3. Elver is exaggerating and is full of crap.) Joey is sent to go retrieve them. As he leaves, he is also reminded that the word “Rumplestilskin” is a magical word for elves and can save them from danger. The elves are indeed at the shoemakers. (From Keebler to cobbler.) The owner, (who I’m naming Sherm) really enjoys it. Mostly because he doesn’t have to pay them. (Slave labor is less wrong when you’ve got an entirely different species doing your work.) Joey arrives as a tiny glowing ball. (Since when can he do that? Is this another elf fact we’re learning today? While I’m on it, why do they have antennae?) Sherm smacks what he thinks is an insect (The antennae aren’t helping make it any easier) but finds it’s another elf. Joey wants his people back, but Sherm is hesitant. He’d have to hire humans then. And they’d probably want *gulp* payment! Or worse, breaks! He also says “Jehosophat” and it turns out this is another one of those magic words that affect elves. It slowly turns them into mice. Now spouting a tail, Joey begs for that word to not get spoken again. Sherm just so happens to have a Sylvester the cat around who is looking at Joey with great interest. The cat leaves and the phone rings. The caller asks for a Jehosophat. Now Joey has matching ears. Then, a telegram is delivered that Sherm reads out loud. It was a birthday greeting for a Jehosophat. That’s done it. Joey is now full on mouse and Sylvester is on the hunt. The new mouse runs into a giant hole. (Seriously, that thing is huge! Sylvester could just follow him in! And for that matter, who made it? They must have rodents of some kind around!) Despite the easier option, Sylvester tries to reach him with a coat hanger, but only nabs some exposed wires. Joey has forgotten the word that will help him and rushes to the phone book, as he at least remembers it was a name that started with R. He finds it just in time and is reverted back to normal. For some reason, this stops Sylvester from eating him. (I’m not an expert on house cats, but aren’t elves responsible for a good 45% of their diet?) Shem tells him to knock it off, and Elver decides to come see why he is still missing elves. (As long as he knows where they are, why does it matter if he has them back or not? We could learn so much about the Elf race, but no, instead we’re going to get another economics lesson.) Elver is here to tell how Sherm can run his business without elves. The main reason he can’t keep up the enslavement isn’t because it’s morally and ethically wrong, it’s just too old fashioned. According to Elver, older methods are destined to fail and must be modernized. (I get what he’s saying, but what if you have a really good way of making your product? One that doesn’t need upgrading.) If he buys better equipment with his profits, he can increase his production, and get an even bigger profit. But the cycle never ends, and he will have to keep using some of his gains to upgrade again and so on. (When, you put it that way, it just sounds depressing.) Nevertheless, Sherm is convinced and agrees to do it the modern way! Six months later, his shop is a much larger building, he has nicer clothes and his own office. Elver shows up again to check in on him. Sherm is doing quite well for himself. He only has one problem now: he needs a name for his new line of boots. Without any reason why, he dubs them “Jehosophat boots.” Turns out, tagging boot on the end of that word instantly turns an elf to a mouse. And Sherm still has Sylvester. Elver runs for his life from the cat, trying to remember the word that will save him, having forgotten it himself. Well, it was an interesting experiment, but I’m not sure how well it worked or was received. Luckily, Friz would go back to directing comedy, which I feel is where he shined best. Directed by Charles M. Jones; Story by Michael Maltese; Animation by Ben Washam; Layouts by Ernest Nordli; Backgrounds by Philip DeGuard; Voice Characterization by Mel Blanc; Music by Milt Franklyn. A Looney Tune released in 1955. Do you remember “Duck Amuck?” It was a pretty well loved short. When someone creates something that the world loves, they can either leave it alone, satisfied that they made something wonderful and let fans cry for more, or they can try to capture lightning in a bottle twice and risk the chance of failing. I wouldn’t say this was a failure, but it really doens’t work with Bugs. But I’m getting ahead of myself. The script tells us we are to start in a classic woodland scene. The animator paints one, but adds Bugs’ hole in the sky. When Bugs sees just who is at the controls for this picture, he refuses to play along. (Don’t blink! When Bugs hits the ground, his leg disappears for a fraction of a second.) The artist stars putting picket signs in his hands. Bugs agrees to work with the artist, but now they are painting various hats on Bugs. (Making the top hat too big is quite clever.) Well, Bugs tried to be nice. Now to leave. But his hole is now upside down in the sky and he can’t get into it, as an anvil is tied to his tail. While he grumbles, his head is replaced with a jack o’ lantern. He requests a rabbit head. It’s tiny. Once it’s back to normal size though, it is without ears. Asking for some gets him human ears. He is given a horse’s tail next. When asking for it to be fixed, he is drawn as a horse. His contract states he is to be a rabbit. So the artist draws him as some fan’s Looney Tune OC. (Though to be fair, he looks better than anything I could draw) Then he is given some clones. His originality challenged, he puts his foot down. He refuses to move until the boss is notified of the artists shenanigans. Said artist calls his bluff, by drawing a train. With no other alternative, Bugs pulls out the “The End” card. Luckily the artist wasn’t Daffy. (That would have made this short bad.) It was Elmer, pleased to have finally gotten even. Produced, Directed, and “Plagerized” by Chuck Jones; Music by Dean Elliot. A TV special released in 1978. Supervision by Charles M. Jones; Story by Tedd Pierce; Animation by Robert Cannon; Musical Direction by Carl W. Stalling. A Looney Tune released in 1943. Daffy is having a grand time flying as only he would up in the clouds, when he is nearly shot. This leaves an impact shaped like him in the cloud, much to his amusement. He screws around with this for a bit, but he is eventually hit and he goes down. After berating the dog who is retrieving him about not being gentle, (whose name is Laramore. A name I’ve never heard outside of this short) he is brought back to the one who shot him: Elmer. Elmer is pretty polite about things. He apologizes for killing Daffy at least. But he defends his actions as sport. Daffy quits faking (Oh come on. Were you really buying it?) and rightfully complains about what a bad example of sport it is. Elmer is armed to the teeth, and Daffy doesn’t have anything but a bullet-proof vest. (“How did that get there?”) He demands that Elmer and him fight in a real sport: boxing. There’s already a ring set up even. (Ducks love boxing you know. How else would there be a full house there already? Clearly, they just sit there constantly waiting for a fight. ) I love the referee at this match. If I didn’t know better, I’d say he’s voice by Tex Avery due to all the laughing he does when he is supposed to introduce Elmer. (“You can have him!”) He finally does get Elmer’s name out, and he is promptly booed by the audience. (To be fair, Laramore cheers for him but the ducks pelt him with projectiles.) When introducing Daffy however, he not only gives him a hug, but addresses him as “Daffy, (Good to his mother) Duck.” Daffy is promptly applauded by the audience. (To be fair, Laramore boos him, but the ducks pelt him with projectiles.) The ref. (who I’m calling Tubbs) begins listing all the moves that are not allowed. He even demonstrates them on Elmer. Daffy wants to be absolutely clear on things, so he repeats all of them on Elmer just so he knows they’re illegal. When the fight is ready to begin, the two are ordered to shake hands. 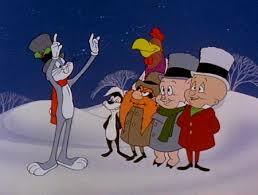 Daffy tells Elmer to pick a hand, and Elmer picks the wrong hand. (There was nothing in it.) Daffy is willing to let him try again, and there is something in the other: a mallet that clobbers Elmer. Tubbs starts the match, but Elmer is already out and Daffy is declared the winner! (Definitely more fair. Daffy is looking out for all the animals that are unfairly killed) Elmer is a good loser. He doesn’t complain, but he does point out that he thought they weren’t supposed to use certain moves. The moves in question being, the ones he is now using on Daffy and Tubbs. Elmer is out in the desert. (My guess is it’s in California. Do you really care though?) He’s off prospecting for gold whilst singing “Oh, Susannah!” (No one sings that anymore though. Shame.) Bugs is there too, hiding under a bovine skull. He says hi to the the passing prospector, who politely says hi back. Not getting the reaction he wanted, Bugs tags along joining in the song. Eventually, Elmer catches on and freaks out. (I know I would be if I saw a singing skull with eyes still in the sockets) He quickly figures out it was just that “scwewey wabbit” and starts digging. (I love how he makes an “X” before digging in a completely different spot.) He drops an explosive down the hole, but it keeps popping back up. In desperation, he zips the hole up an hides. Being the nice guy he is, (*snicker*) Bugs returns him his T.N.T. Elmer cowers, but the stick was a dud. That doesn’t stop Bugs from shouting “BAM” anyway. 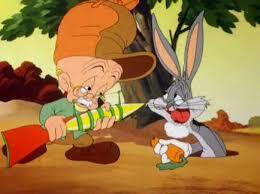 Elmer grabs his gun but Bugs has exciting news: Gold has been found! Where is it? It’s his gold tooth. Elmer shows off his own before realizing the trick. He tries to dig Bugs out of his hole, but his pick axe has gotten stuck in the cliff wall behind him. 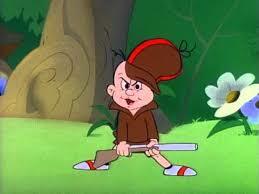 Bugs uses this opportunity to cut Fudd’s clothes off, revealing his girdle. Seeing us laughing, Elmer scolds us saying that he’s sure plenty of us men wear one too. (Not me personally, but I love how calm he is about the whole thing.) Redressing, he leaps into the hole himself. Bugs buries him and walks off. (Notice that the shot has changed. They were in a canyon before, but now they appear to be out in the open.) Elmer escapes somehow and tells the wabbit his plans: he came for gold, and he’s going to get it. And Bugs definitely has some. Bugs is not willing to part with a piece of his body, so Elmer tackles him and wrestles it away. The short ends with him smiling at his success, unaware that the tooth he is holding is his. Here’s your final entry of 2016. Everyone has already said that this year sucked. They’re right. 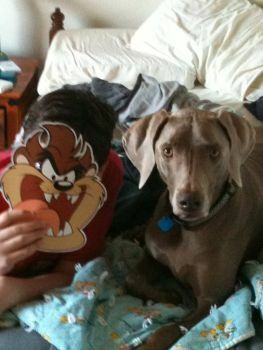 I’d go more into it, but this blog is for Looney Tunes and Looney Tunes related things. So, let’s just agree that the year was crap, we’ll hope the next will be better and around this time next year, we’ll be saying the exact same things. Now then, with time constantly moving on, why not talk about a short that shows just that?